Karina's Kreations: Thailand Achievers Blog Hop! Welcome to the December Thailand Achievers Blog Hop. The theme this month is Occasions Catalog Sneak Peak! The new occasions catalog runs Jan 4 - May 31. There are so many fun products in this catalog! I hard a hard time deciding which sneak peak I wanted to share with you. I finally settled on a new product bundle that includes a Special Reason stamp set and matching Stylish Stems Framelit Dies. You can save 10% when you purchase these items as a bundle #144720. I'm a Canadian demonstrator so when you purchase the bundle and a package of Shimmery White card stock, you can get the Any Occasion greeting stamp set or Metallic ribbon for FREE. Sale-a-bration runs from Jan 4 -Mar 31. You get free product with every $60.00 order. My card uses an inked background technique. Choose three colors of ink. I used Flirty Flamingo, Melon Mambo and Rich Razzleberry. In a circular motion, sponge Flirty Flamingo in five places onto Shimmery White card stock. 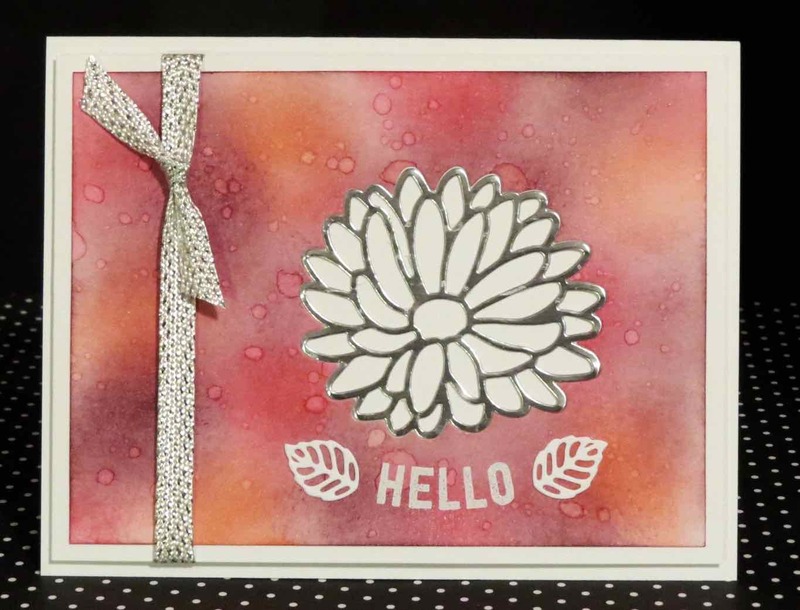 Using a circular motion sponge Melon Mambo ink in five places on the card stock. Fill in the spaces with Rich Razzleberry ink until all the card stock is covered. 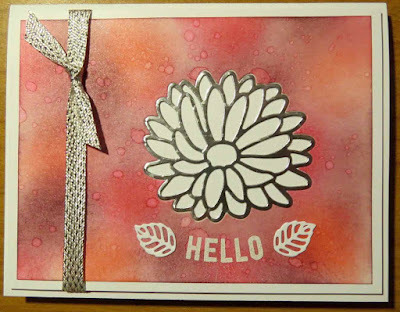 Dip an aquapainter or paint brush into water and tap over the card stock. Set aside and let dry or use a heat tool to speed up the process. I cut a flower shape out of the Shimmery White card stock using a framelit from the Stylish Stems Framelit Dies. This cardstock was attached to 4" x 5-1/4" Whisper White card stock. I cut the flower shape from Silver foil and attached it to the card with mono multi liquid glue. The greeting from the Any Occasion Sale-a-bration stamp set was stamped with versamark ink and embossed with Whisper White embossing powder. I added some new Sale-a-bration Silver Metallic Ribbon to the card stock and attached it to a Whisper White 5-1/2" x 8-1/2" card base. Make sure to check out all the other fun projects in this blog hop. Great card - very elegant! Thanks for sharing and Happy New Year! Your technique sound like fun! Beautiful card. Oooooh - love your background! Thanks for sharing how you did this! Thanks for your kind comments! 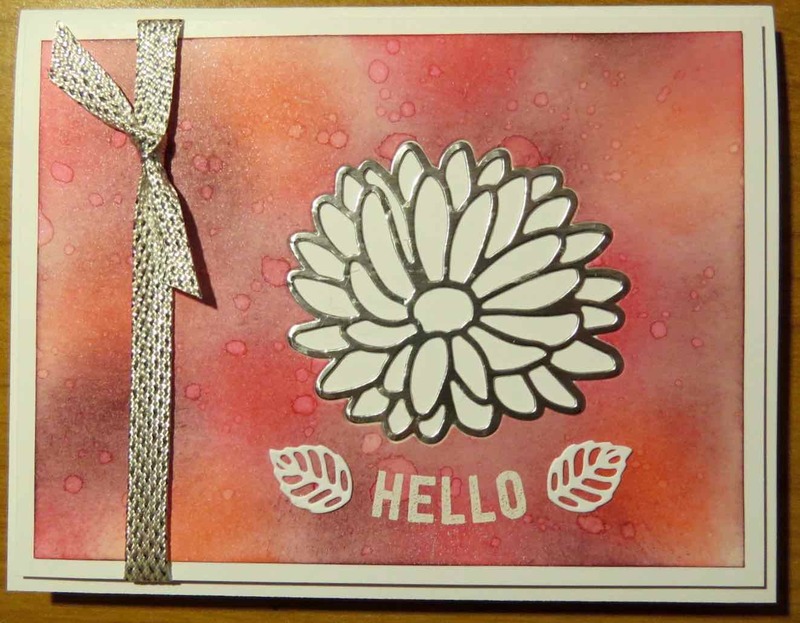 I'm making this card for a technique swap in January. It's really fun!